In this week's Abundance Insider: Cancer-detecting smartphone add-ons, Nobel Prize-winning nanotechnology, and a 3D printed heart-on-a-chip. P.S. Know someone with big, bold ideas? Send them this link to subscribe to Abundance Insider and help fuel their vision. What it is: Uber recently made the world's first autonomous truck delivery, driving 120 miles to Colorado Springs, carrying 50,000 Budweiser cans as cargo. The self-driving semi uses three LIDAR laser detection units, a radar on its bumper and a camera above the windshield. Otto's long-term goals for the technology include navigating construction zones, predicting drivers' movements and dealing with hazards like bad weather. Can This Year's Nobel-Prize Winning Invention Enable Immortality? What it is: This year's Nobel Prize in chemistry went to three scientists who developed "the world's smallest machines," and these molecular machines could hold the key to true longevity. Jean-Pierre Sauvage, Sir J. Fraser Stoddart and Bernard L. Feringa developed the nano-machines to target a human's plagued cells with the exact medicines needed; in the long run, they could even perform microsurgeries, changing medicine as we know it. What it is: Researchers from Washington State University have come up with a smartphone-based diagnostic rig that can diagnose cancer with 99% accuracy. The rig involves a 96-well ELISA assaying plate, a 3D printed cradle, a smartphone with a camera, and a microprism array. It detects the inflammatory biomarker interleukin-6 (IL-6); while this marker is mostly linked to depression, allergies and mood disorders, the researchers say it's also "closely linked" to a variety of skin, lung, liver and breast cancers. What it is: Harvard researchers have developed new printable inks for multimaterial 3D printing, allowing them to 3D print a heart-on-a-chip with integrated sensors to simplify data collection. In all, the team developed six custom 3D-printable materials that could replicate the structure of human heart tissue, except with embedded soft strain sensors, according to New Atlas. What it is: TU Wien researchers have created permanent magnets using a 3D printer -- a world first. Their magnet printer uses specially produced filaments of magnetic micro granulate held together by a polymer-binding material. The printing process creates a three-dimensional object, which is then magnetized with a strong external magnetic field. What it is: Engineers and chemists at Virginia Tech have produced flexible solar panels that capture light from both the sun and indoor light fixtures. The panels were created through a screen-printing process that used low-temperature titanium oxide paste as part of a five-layer structure, similar to how bathroom tiles are layered. A single palm-sized panel provides about 75 milliwatts of power, and a panel the size of a standard sheet of paper could recharge a smartphone. The process enables us to efficiently fabricate large-area modules and place them in areas where silicon and glass aren't feasible -- for example, light-harvesting wallpaper, lampshades and curtains. What it is: Data scientist Samuel Bennett's latest chart compares cable, Netflix and Comcast subscriptions by quarter, and the trend lines are staggering. 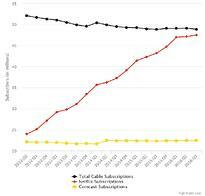 Between Q2 2012 and Q3 2016, cable subscriptions have decreased by just over 6%, while Netflix subscriptions have increased by over 98% and Comcast subscriptions have increased by 1.27%. If these growth patterns continue, we'll see more active Netflix subscriptions than cable subscriptions sometime in 2017.